Every once and awhile as I’m sending off a new design to be approved by that weeks group of marketers that are currently in power, I think back to when I was in lobster fisherman’s school. How crazy it would be to go back and tell that bright eyed and sea soaked kid that all of his dreams will go nowhere and he will end up using “computers” to make things for people to look at on the “internet.” He would probably just burst his emergency squid ink pouch in my face and dive back down into the lobster trenches for safety. Those were the days. You were a lobster fisherman’s pupil too? Then you must’ve been to the lobsterconvention of ’53! I was there as well! Music week? I like that rocket fuel mug, its a nice touch. Looks like Mordock’s Benzite breathing apparatus from TNG. Wow. I need to get one of those. Never again will I be forced to hold my sandwiches! I really hope my Manager doesn’t see this. He’ll INSIST that is how we eat every day. Coffee cup, you did it again. Another unavailable product I MUST have. Along with the cereal slingshot and personal rocket. Hey a futurama reference nice. my dreams of becoming a comic novelist shall be commenced, so long as i can get past the first chapter and be happy with my work. I never saw that episode. 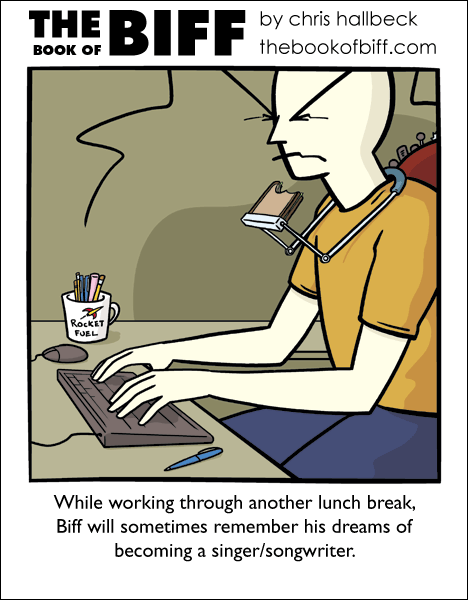 But your comic makes me cry, because I remember times like those too, when I wanted to be a game developer. I can’t believe I’m the first to comment saying how much I want a device that holds my sandwich for me. That sandwich holder could be patented. I’d buy one! If you ask me in n years you will be living off of your comic strip Chris. Now I just have to figure out what n is equal to. The rocket fuel mug would be purchased by me as soon as I stop having insomnia. I know this comment is more than a year late, but it saddens me that nobody got the Bob Dylan reference.